Other than that some sheiks, some scholars, some inviters and some masters are in those declared dangers. However, praise to Allah that, our Sheikh is excluded and far away from them. However, he feels sorrow who acts like this. The real source of everything you see here is our Sheikh´s invitation. This is such an invitaiton that ; it follows the path of Hz. Muhammed and His close followers. The guidance and the invitation of our Sheikh is such an invitation that ; it is far away from selfish interests, bad intentions, exploitation and politics. We must prove that we are good Muslims by securing people from the acts of our hands and tongues. We must adduce proofs for existence of our belief by purification of our hearts, cleanness of our souls and beauty of our words and works. May Allah enable us to be prepared for the frightful Judgment Day. May He give all of us the required wisdom and skill to get prepared for it. May Allah grant us such an intelligence and consciousness that we understand to wander around the worldly pleasures is for nothing. May He make us to understand that the real important issue is to return Allah and to get prepared for the Judgement Day. This community is Islamic and just for pleasure of Allah. Thus, this sect is in full compliance with our Prophet, Hz. Muhammed´s (S.A.S.) Law. Because there is no modification, exploitation and politics in this sect. If a sect involves modification and religious opposition that is not a straight path. Islam s law is a scale, a regulation. We understand if the sect is right or not with the scale of Islamic law. There is a lot of difference between knowing and feeling. If we felt being watched by Allah, we would definitely not commit to sin. We would repent immediately as soon as we commit any sin. O my brothers and sisters! Each of us would not commit to any sin and repent immediately if we are conscious that Allah is watching us. The customs of the sect prepares it´s member for the perfect living of our Prophet s (S.A.S) Law day by day, month by month and year by year. And it leads the disciple to perform prayer in respectful peace and fear for Allah only. Affection and unity are the essentials of power. A nation, whose unity is damaged, are sentenced to fall down. If unity and cooperation among Muslims is maintained Islam religion will rule over earth as in the old days. May Allah grant us the required wisdom for our unity and cooperation. We are required to practise the duties assigned to us. Everyone should practise according to his level. Less educated people is supposed to be accordingly sofi, accordingly scholar, accordingly traveller and accordingly performer of practices. When one is scholar, or sufi traveller or practising remembrance and daily acts, he must work harder. If one says I can´t have any benefit without working, whose fault is it It is the fault of one who doesn t practise. For this reason it is not possible for him to reach his aim. My dear brothers and sisters! Islam has been the religion of examination from the very beginning. Enemies of this religion always existed and aimed to destroy the building of Islam and to shake the foundations of the religion. Today´s Muslims faced huge difficulties. The denial waves are trying to waste their lives and conspire them and want to mislead the youth. People having no sense of the permissible (halal) and unpermissable (haram) are trying to demolish Islamic regions from east to west presenting huge threats. O my brothers and sisters! I swear to Allah that our Sheikh was never satisfied with external appearance. He wanted us to be real Muslims and truthful ones. Praise to Allah that there are such people coming from miles away who were far from performing prayers, sincere worshiping, beauties of Islam and sufism. Now they became experts of worshiping, remembrance, khatme and conversation. Speaking to the crowds, our Sheikh said: ´I swear to Allah that I definitely do not see anyone among you lower and more incompetent than my own self!´ O, people! Don´t let yourself be deceived by the crowd that surrounds you and regard yourself lower than everybody. Some resorts were apart from the unity of Muslims and customs of Islam religion. But now, they found themselves in an extreme brightness, conscious, affection and brotherhood. People are running to religion. They are holding on tight to Haznawi sect. Thus they are prefering the correct decision. There is no better preference than the choice of Islam and Islam s customs. Satan tells to young victims that; ´you are young, come on commit sins, join entertainments.´ Wealthy people are told that ; ´you are superior, live enjoyable pleasures with them, live your own life.´ While these scenes continues, death arrives and they enter into the dark grave. They then realize the truth and they are misleaded by Satan. This convent upholds advice, lessons and lectures. Just for the sake of this crowd and this meeting, we are required to learn our lessons and gain good conducts above all, to achieve the well-manners. There are two types of people; intelligent ones and ignorants. A wise person is the one who ignores the lusts of the substantial world and dedicates his whole youth and life to Allah. Ignorant one though is defeated by the substantial world and it´s pleasures. Their hearts are sealed hence their addiction to the materialistic, fake world life and lust. A person with high morals and well-manners can not approach committing sins. These well manners are for Allah. They are to respect and consider Allah. We respect and consider our Prophet (S.A.V.) for He is the messenger of Allah, we respect and consider our saints for they are loyal and straightforward to Allah. Therefore such respect and well manners are considered respectful acts for Allah finally. My father, Sheikh İzzeddin el Haznawi (K.S.) left such great works behind and undertook such fine things that he welcomed anyone no matter what sect, race and religion people were. He taught then Islam and good manner to them. He, who wants to enlighten the mankind, must consider everyone. It must not only for a single group or community, since only the group members would listen to him. Others would not, even if he tells the truth. Formerly Islam religion used to be like a family. However, recently Muslims were alienated and now look how we are. Once a disciple has learned to say Allah Allah with his heart, his heart is his controller. This relation forms a respectful fear and modesty towards Allah. One is conscious of being under Allah s supervision. He knows that Allah sees him. Thus he does not approach to sins and his heart does not approach to material world. One is required to perform more practises here than he did at his home and country. It is not possible to reach to aim and requested without practise. One can t reach to his aim with expectations. This is the place of good manner, discipline, practise and working. One must required to think and act that way. O muslim, I am telling you frankly. A disciple from us, a student, a relative of us, anybody approaching you with the demand of property, with the will of political benefit is far away from us and we are far away from him. Leave the student, relative aside even if I approach you for property, estate, position or with a political will tell me to get away, tell me that we didn t heard and saw such thing from our Sheikh. O my dear brothers and sisters ! Believe me that the love of this present world is like cancer disease. One must work to earn his family´s livelihood, this is also worshipping as well. However one must not carry the love of this present world in his heart and this must not keep him away from worshipping. Yielding to carelessness is a misdeed. A bigger misdeed than this is the carelessness with one s own intention. We should think how a huge misdeed is the carelessness while sitting, laying. This sect shows the right way of our Prophet (S.A.S.) to its disciples. Therefore, this sect is the servant of the Law of Islam. We ought to consider small sins as dangerous as the big sins. If we ignore small sins, they will lead us to commit bigger sins. Even many people have quit those free things in order to achieve pleasure of Allah. I invite all my Muslim brothers and sisters to love everyone, to be merciful towards them, to be unified not to separate into parts. I pray to Allah for Muslims never to separate from unity and cooperation and support each other and not to lose even any tiny part of their land. Whoever gives effort to get back the holy Jerusalem, being one of the three Harems and two qiblas, may Allah be with him. One is not able to achieve Allah´s pleasure without any effort. He is required to work and practise to reach the pleasure of Allah. Just as someone asleep cannot view the stars, one can not achieve any yield of his gardens, fields without processing them and working on them. Sufism is the essence, core and the beating heart of Islam. Sufism is to live Islam in most convenient way. The whole purpose of the sect is to invigorate the way of Hz. Muhammed (SAS) and to spread His living practices. Therefore, I ask you all to pray to Allah for me that He succeeds me to live this sect in a most superior way and maintain it. Thanks to Allah for I don´t ever deal with two things. First, I keep away from politics both in my country and abroad and I don´t intervene to political affairs. The second issue is that I don´t want any worldly material from anyone, either it is offered I do not accept. There are more than 1500 disciples in this school, seeking for the truth and wisdom in its source. Anyhow if there is wisdom there is everything. Therefore, you are expected to spread this sect everywhere with knowledge and wisdom. If you act such the continuity of wisdom in our place is ensured with Allah´s permission. Our Sheikh is such an inviter with his endless energy, vivid mind and effort that he is the greatest bounty of Allah to us ever, for to practice Islam as it is, for to teach and spread it maturely. Human has three big enemies. Everybody knows two of those, satan and material world. But there is a more dangerous enemy that only good people and Nakshibendi masters knows; that is own soul. I praise to Allah for welcoming you to the land of lovers who planted the seeds love to the hearts of people. Like the poet said, I´m on the way to Leila, Kissing the rocks, kissing the walls, But not they stole my heart, It was by Leila, sitting under them instead. It is the beloved one. May Allah strengthen this spiritual relationship between us and may this relationship serve to pleasure of Allah only. A man with good manner does believe with full trust in Allah´s divinity, customs of glorious masters, warners grants. If one has such belief and guarantee this will not only cover the customs and remembrance but all his acts. If you acquire Islamic exertion and majesty, you are expected to grab and warn me in case of I tend to leave this way, reminding me of being the son of the Sheikh. The customs of Islam and this sect requires to act like this. Islam is brave, believer must be brave and advisor, he must not be fearful to say the truth he must not be hypocrites. Allah commands in one of the verses of the Holy Koran: ´He, who is prevented from remembrance, obedience and worshipping to Allah because of his wealth, family and children, will be from the sufferers.´ The punishment at the judgment day is known to all of us. That person has no peace on earth since he worries about his children and property. He never feels comfortable. He always suspects the loss of his property and worries about the health of his wife and family members. O my dear brothers! Praise to Allah that the sect of our Sheikh has been wide spread and gained reputation. This sect won´t be harmed and spoiled through a tiny mistake of a caliph, a scholar or any family member of Sheikh. I pray Allah to succeed me and you to strengthen the basics of the rules set by our Sheikh. The sect of our Sheikh is a community of science, endeavor and ability. It´s not a sect of ignorance. If a sect is established upon ignorance, than it is perished and has no benefit. However, if a sect is based upon knowledge, it all becomes ability and divine light. One reaches to the truth with the balance of knowledge.
) With the help of sect, individual approaches to Allah s control and Law turns into aptitude, nature and habit. For instance, man likes to glance lustfully at unfamiliar women. However, he cannot consider the same type of glance to his own sister, he is disgusted with it. Thus, if the disciple obeys the customs and lives accordingly, he will quit doing the same to other women as well, just as he does not to his own sister. If we meet a person suffering with the illness of sins and mistakes, let us cure him with the medicine of affection, friendliness, kindness and advice. In other words, let us warn each other in a good way and wisdom. Islam is not the religion of frightfulness, lack of self-confidence and imprudence. Let us counsel each other for Allah´s sake. May Allah reward all Muslims with power that arise from their strong belief, strength and glory because of their spilled blood. May Allah reward all and every single Muslim with the revival, refreshment and resuscitation of the Islam in their hearts and souls. Some believers are ashamed of stretching themselves to beds in their rooms hence they are conscious of Allah s power and greatness. Allah rewards one according to his manner towards Allah. He gains benefit according to his manners towards the Prophet and obtains reward and spirituality with his manners towards saints. Telmaruf is the place of seriousness, effort, discipline and work. It´s not a place where world´s blessings are desired. Anyone who visits here must work to improve himself and to enhance his nature. The virtues are in danger. You are required to give up your soul if you want to maintain them. Unfortunately, we are unable of this. We can´t leave our homes, families, children and business. But we still want to reach high positions and high virtues. Allah´s greatest favour to this Islamic community from His compassion and mercy, to protect Islam religion, is the great scholars and saints who are practising and spreading in accordance with their knowledge and Prophet s way of living and manners. In our time the impudence and sinfulness increased, unawareness and worldly affection grew and formed a curtain between Allah and us. Let us increase our effort and working against those huge and horrible sins. Let´s try hard in order our practises are for pleasure of Allah. O my Allah! I m the worst of people if you don´t forgive me. You hide my disgrace and dressed a clean and a beautiful clothes. They began to like me, nevertheless I m not someone of to be liked but they resembled me to others. I m aware that you don t need our world because we are not that kind of people who deal with politics and the material world. Believe me, I m ashamed of giving sermons. Where is the star of Sorayya, where is the earth. I beg from Allah to favor me because of you and He benefits you because of my words. The customs of Nakshibendi Haznawi is like hospital. We are the patients of this hospital. Our illnesses are spiritual and internal illnesses. However, they are more important than external illnesses. Once the therapy begins, the patient must supposed to listen the doctor and use the medicine prescribed. The medicines for spiritual illnesses are these customs, remembrance and supervision of Allah. To practice with the sermons, lectures and customs that we heard from them is our greatest opportunity and booty. Because we might face obstacles in the future. It is a great opportunity for you to be in this convent and tomb. My dear brothers, there is nothing left we didn t hear and see from our elders. We had the chance to talk and consult with them. The benefit that we will gain from them is to practice whatever we heard and saw. However, if we fail to do so, it is impossible for us to gain any benefit. Death is not frightening since human is not impermanent. He, who gives effort for the religion and fights in the right path, naturally wishes to reach Allah. Death is the passage from the ordinary world to exalted world. There is no doubt that, belief is the greatest gift of Allah to mankind. Affection is the biggest sail for one to reach belief. Good manner is no coincident. Manner is related to heart. If there is a spirituality in the heart than all of the organs are well mannered. But if the heart lacks of spirituality than good manner will not last long and then one will be far from being well mannered. We want you to save yourself, we want you to be beneficial to your brothers and sisters, your neighbors, your nation and your states. If you want to show honor to me, do as such. If you want to show honor and respect to us and want to benefit from us turn towards Allah. Hold on tight to the rope of Allah and keep away from the prohibitions. This is your gift to us. I feel I don´t deserve this place whenever I remember the faces of those virtuous and respectable people. But now they assigned me this difficult task, handed me their robes and passed away to infinity. The one inviting to the way of Allah is supposed not to deal with politics and must not collect people s wealth. ´O, Soul ! You want to purchase precious things for nothing. Unfortunately you can not own that precious things without working and practicing. If one wants to eat honey, he must bear to bites of bees. He must bear to difficulties, torments and troubles in order to reach to the objective and demanded. The one who practices the Shah of Nakshibend´s (K.S.) deed, he will reach his level. The one who practices the Sheikh Abdel Kadir-i Geylani´s (K.S.) deeds, he will reach his stage. However, it is not ever possible to reach such positions without practicing, without working, without putting effort. You must turn towards guidance of Allah and must fight with your own souls and evil. This is your biggest gift to us. I pray to Allah to realize your goodwill in this humble servant and thus lead you to your earnest desire. Allah has the power over all things. The one who wants the present world must try to please Allah, the one who wants the hereinafter must try please Allah. The one who wants both this present world and hereinafter must try to please Allah. The pleasure of Allah is superior than everything. The will of one must always be the pleasure of Allah. Everything is in Allah s hand. The customs of this sect is serving to the Law brought by Hz.Muhammed, our prophet. I tell this for Allah and His Messenger. We learned the customs of this sect from our masters. We heard from them. We saw with our own eyes. These pure customs are agreed by the Law and Living of our Prophet. We didn t ever see from those customs anywhere, neither in East nor in West. The real happiness and real life in this age, where digressing from Allah s religion, acting unlawfully and wrongly are deemed as honor, is possible only with holding tight to the religion of Allah and to continue in this way. One without experiencing the customs, without being together with people practicing the customs can not understand this path. Someone holding on and practicing this customs will prefer this path upon his soul. If one s belief in Allah is strong, he will welcome anything from Allah. He says everything is pleasant as long as it is from the Beloved and does not rebel to Allah. He yields whatever Allah wished and thus live peacefully in the world. Only to direct to Allah ceases the disorderness in heart, only closeness to Allah removes the brutality. The fire of lust in our hearts extinguish only with love of Allah, remembrance, truthfulness and being sincerely purified towards Allah. My sole wish from Allah, the one and only, is to give us a healthy and fair sense of intelligence and with those to lead us through His own way. One is supposed to deal with things approved by Allah. He is supposed to always have a pain in his heart and suspect sadness about Allah s being satisfied with him. Classify yourself with the good and ideal people. It is for sure that to resemble them is salvation. 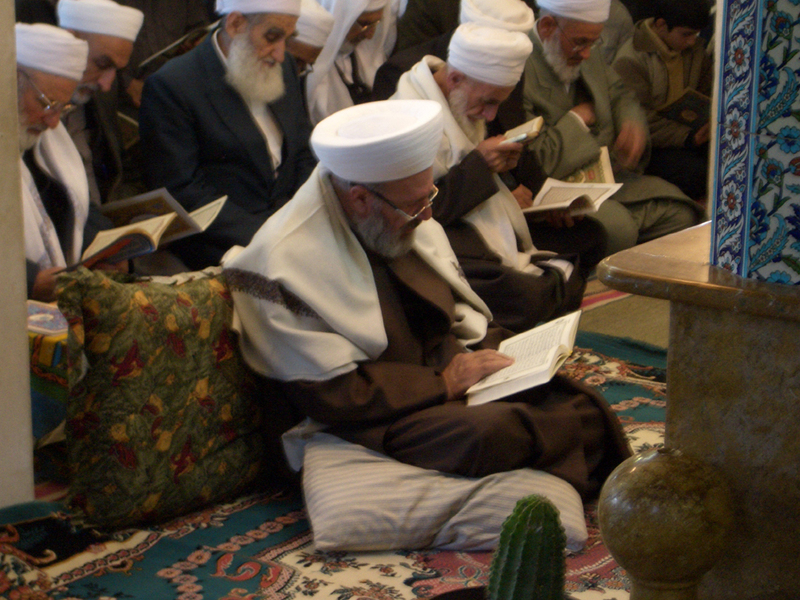 The main purpose of the Nakshi-Haznawi sect is to apply the practical aspect of Islam. A disciple is required to refrain from the prohibitions, to fulfill the obligations and to quit the permitted if not appropriate. Improvement of feelings of heart and training one-self is only possible with a strong belief, a good practice and the satisfaction of the instructions of Islam along with the education of prohibitions and permissions. A person who is dishonest and imprudent in his prayers is unable to improve the feelings of his heart and can t train himself. In fact, death is a new life. The real death is the death of one s heart, the disbelief, the disbelief in hereafter, to be deceived by lust and to sink deeply into the darkness of temporary worldly pleasures. A smart person is the one who deems the worldly matter which are other than worshipping to Allah as unnecessary waste of time. One must supposed to establish the relation between his Lord and himself. One must regard himself unsufficient in adoration and worshipping to Allah and must consider the well-mannered people as samples and must imitate himself to those whose conducts are in compliance with our prophet s way of living and ethics. If one aims the pleasure of Allah in any work, he will absolutely succeed. If his objective is the present material world he is bound to fail. If one´s intention is for Allah´s pleasure, Allah generously opens every door for him. If we do not act in compliance with Islam and abscond to teach its virtues to our children, we will end up in deep regret and grief after our deaths and both us and our children will perish. This means that one of the objectives to visit here is to hold fast by the rope which Allah stretches out for you. All the prophets, diviners and scholars came to give effort to show the decent and the right way to mankind.